Land of the Free? America was founded on freedom, liberty and justice. So why is it that we lock up more of our citizens per capita than any other county in the world? Are Americans just inherently criminals? Australia was founded as a penal colony and they have less than a fifth of the prisoners we have per capita. 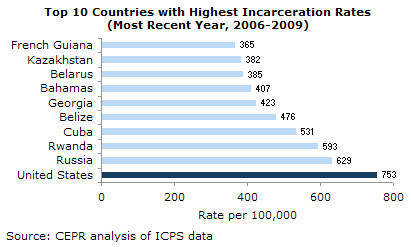 The chart to the left shows the incarceration rates for OECD countries (i.e. countries like us). You almost miss the dark blue line at the bottom which shows that America locks up over three times as many people as the next biggest offender (pun intended). Is it that our prosecutors are eight times better at convicting criminals than their German counterparts? I think this chart is even scarier. I thought for sure that communist countries and dictatorships would lock up way more of their people than us. Of course, this assumes we can trust the numbers from Cuba and Rwanda. But while we’re here, maybe I can postulate one possible reason why so many Americans are in jail instead of being productive members of society. In 1971 President Nixon declared “War on Drugs.” Then in 1984 Congress passed the Sentencing Reform Act which decreased the amount of discretion Judges had in sentencing and shifted priorities from reform towards punishment. As a result, non-violent drug offenders faced minimum sentences and were introduced into the prison cycle. Since then, millions of Americans have been locked up and saddled with a criminal record for an activity that our last three Presidents have all admitted to partaking in. Drug abuse is a very serious problem; but is it a criminal problem or a medical problem? We treat alcoholism as a medical problem. Is alcohol really that much different? It’s an addictive chemical that alters our behavior and, when abused, has harmful affects on our health. Same with cigarettes and we’ve reduced the rate of smoking through health risk awareness, social pressure, laws against smoking in public places (which I personally think are BS when it comes to private establishments but that’s a different subject) and treatment programs. In the 1920s we treated alcohol consumption as a crime and it spawned organized crime. The drug gangs of today are no different than the gangsters of the 1920s. Making drugs illegal drives up the price of drugs which incentivizes sellers to enter the market, push their product on potential customers (especially kids), and battle over territory. Since they can’t get protection from the police, they are forced to arm themselves. Addicts are often forced to resort to robbery to pay the excessively high costs of their habit. No one knocks off a liquor store for a pack of Marlboros. In 2001, Portugal “decriminalized” all drugs including cocaine, heroin and methamphetamine, and instead of prison sentences, offered treatment to people caught possessing drugs. Far from becoming the haven for “drug tourists” as critics predicted, drug use among teens actually dropped and drug related pathologies such as AIDS and drug-use deaths dropped significantly. Maybe if we rethought our drug policy, we could lower our incarceration rate by 84% to match Portugal’s rate here in the land of the free. 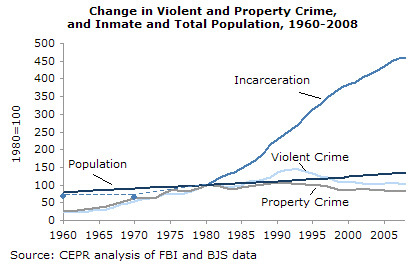 This entry was posted in Chart of the Week and tagged crime rate, drug abuse, drug decriminalization, drug legalization, drug war, freedom, incarceration, incarceration rate, prison, sentencing reform act, war on drugs. Bookmark the permalink. Decriminalization ain’t going to happen. Too much money involved. Do we own our bodies or not? What about all the other laws that makes crimes of things that shouldn’t be?